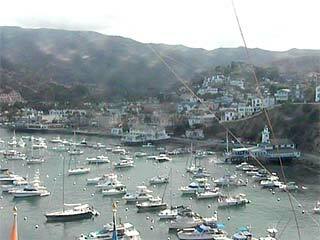 This website has over 30 webcams in Los Angeles area. 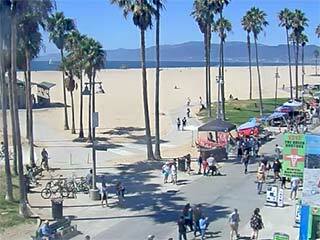 For the best beach destinations in Los Angeles, there is Santa Monica and to the south there is funky Venice Beach. Santa Monica is well known for its temperate climate and the world-famous Santa Monica Pier. If you are planning a visit, there are many luxury hotels in Santa Monica to choose from. If you want to get the down-to-earth experience, you should check out the Hotels in Venice. Though both of these locations are next to each other, in many ways they are worlds apart. Live streaming pan, tilt and zoom Flash web cam from wild and crazy Venice Beach. Live straming Flash surf cam from Topanga. 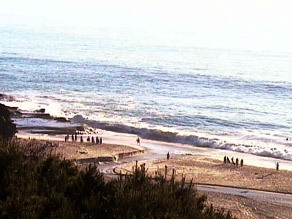 Streaming and panning cam from Sunset Beach in Pacific Palisades. Live streaming pan, tilt and zoom Flash web cam from the Santa Monica Pier where the Historic Route 66 ends at the Pacific Ocean. Large HD still image updated every 10 seconds. Still image updated every few minutes from ABC 7 News. 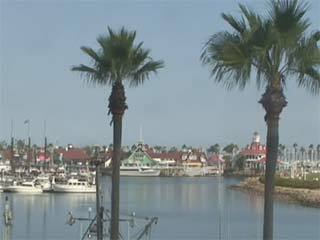 Rotating streaming cam from Long Beach Marina. Steaming live web cam. A view of Avalon bay and the Casino. 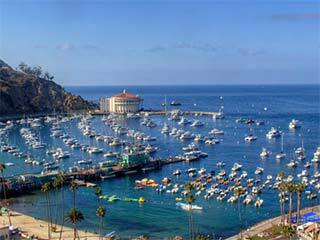 Panoramic still view from the Catalina Island Casino. Streaming Dock view of the Catalina Express ferry. Large still image of Avalon Bay updated every five minutes. Live straming Flash cam from huntington Beach. Web cam of the Ferry at the Balboa Peninsula. Updated every 10 seconds. Earthcam streaming Flash web cam with pre-roll advertising. See the beautiful homes and the beautiful people at Laguna Beach. Still image updated from ABC 7 News. Streaming Flash surf cam from Surfline with pre-roll advertising. From the beaches of Santa Monica and Malibu, to the designer stores in Beverly Hills, to the movie studios in Hollywood, Los Angeles has something for everyone. Los Angeles is a city that's vast, sprawling and diverse, yet very dynamic. It is a mix of many different cultural and ethnic backgrounds and social classes. Los Angeles (or LA as it is most commonly referred to) is home to the nation's top film and television production. On any given day you can probably see TV and movie stars shopping around town or eating in trendy "hot spots." With over 3.5 million people, Los Angeles it is the 2nd largest city in the U.S.
LA is made up of many different areas and neighborhoods, so a car is an absolute must to get around town. On the "Westside" near the beach, there are the areas of: Santa Monica, Venice, Marina del Rey, Brentwood, Pacific Palisades and Malibu. These popular beach areas have some of the city's best hotels. Air travel in and out of the Westside is an easy 20-30 minute commute from Los Angeles International Airport (LAX). Plan your entire holiday visiting the LA area, or stop there on the way to your vacation in Hawaii or San Diego. While visiting the beach community of Santa Monica, be sure and visit the Santa Monica Pier. There are games and rides for "kids" of every age. It is also where the historic Route 66 officially ends at the Pacific Ocean. Near to the Santa Monica pier is the 3rd Street Promenade. This terrific outdoor shopping area is 3 city blocks long and closed to cars and traffic. There are shops, restaurants, cafes, movie theaters, and best of all, street performers that will sing, dance and all-around entertain you as you stroll around down the block. Saturdays and Sundays are especially popular on the Promenade. Hotels and lodging in Santa Monica is also very diverse. Travelers can book anywhere from a 5-star hotel near the beach to a little 2-star motel or hostel. Marina del Rey borders Venice to the south. This elegant, waterfront neighborhood is home to one of the largest recreational marinas in the country. There are several luxury hotels in the area, as well as a slew of top-notch seafood restaurants to choose from. You can take a walk through Fisherman's Village and rent a boat for an hour or a day. You can also take a sailing lesson, go on a fishing day trip, or just throw out a line and start fishing off the channel. 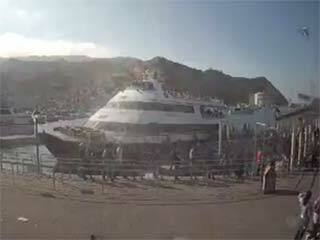 In the summer you can take the Ferry to Catalina (the Catalina Express). On the other side of Santa Monica, to the north, is the Famed Malibu Beach. Malibu is home to many of the top movie stars and industry moguls. There are several chic restaurants in the small center of town. Take a stroll along the beach and see firsthand the beachfront homes that start at around $4 million for a shack, to upwards of $20 million. Take the afternoon to lounge on the beach and get a tan. There are even a few choice restaurants that are literally right on the beach. Where you can put your toes in the sand while enjoying calamari and a tequila sunrise. Inland from Santa Monica, to the east, are the wonderful residential areas of Brentwood, Westwood and Bel Air (as in The Fresh Prince of Bel Air). Another must see is the J. Paul Getty Museum. This is a museum like no another. The buildings and gardens themselves are as much as a draw as the artifacts inside. Set high atop a hill in the Brentwood area, the views from this modern masterpiece in architecture are phenomenal. You can meander through the beautiful gardens, have lunch or dinner in its world-class restaurant or see the thousands of masterpieces in its collection. These include painting from such masters as Monet and Van Gogh. Newly re-opened is the Getty Villa in Malibu / Pacific Palisades. East of Brentwood is Beverly Hills, world famous for its movie-star residents, luxury retail stores and fabulous restaurants. On famed Rodeo Drive you can shop in such luxury stores as Cartier, Tiffany, Gucci, Chanel, Louis Vuitton and Ralph Lauren, to name just a few. Just around the corner are the elegant, larger retailers such as Saks Fifth Avenue, Neiman Marcus and Barneys. During the holiday season, the storefronts and streets are lit up brightly sparkling with lights and stunning ornaments and there are even crystal chandeliers that line Rodeo Drive. While you are there be sure to at least have lunch or dinner in one of the fine hotel restaurants, such as The Beverly Hills Hotel and its famous Polo Room, the Regent Beverly Hill Hotel (where "Pretty Woman" stayed) or at the romantic Bel Air Hotel (Oprah's Favorite). Or, have dinner in one of the many long-time established restaurants such as The Palm, Dan Tana's, Spagos or Trader Vic's. Make sure and look around for celebrities while you are there. At night Beverly Hills and its neighboring West Hollywood and Hollywood are know for their trendy "hot spots." Many of these bars and night clubs have exclusive VIP rooms reserved for the very rich or famous night owls out to party. During the daytime in Hollywood be sure to stop by Grauman's Chinese Theater to compare your hand and shoe size to those stars that have permanently sealed them in concrete. You can even see the latest movie there. During the summer months try and see a performance at the Hollywood Bowl, a beautiful outdoor amphitheater. Just east of Hollywood you can take a walk through Chinatown and experience some of the best dim sum around. If you are traveling with kids, a visit to Griffith Park can be lots of fun. On over 4200 acres, the park has a multitude of activities, such as the LA Zoo, pony rides, hiking trails, a train, merry-go-round and the terrific Griffin Park Observatory. Oh, while you're in the area be sure and look up to see the famous "Hollywood Sign" situated atop the hills of Hollywood. Los Angeles also has several amusement parks around the city to choose from. There is the original Disneyland in Anaheim, as well as Knott's Berry Farm. There is also Universal Studios located in Universal City and only minutes from Hollywood. Then there is Six Flags Magic Mountain, about a 25 minute drive north of LA. If you have time, check out Downtown LA. There you can visit Olvera Street for a taste of authentic Mexican food and see the city's oldest home. Along the courtyard there are many souvenir stands selling traditional Mexican clothes, instruments and treats. Just a short walk from there you can see the new Walt Disney Concert Hall as well as the Music Center. You can either buy tickets to a performance or take a guided tour of each of these theaters. Also Downtown is the Museum of Contemporary Art (MOCA). It houses one of the most spectacular collections of contemporary art collections in the country. Just west of Downtown is Museum Row, located in the Mid-Wilshire area. There you will find the LA County Museum of Art (LACMA). This large complex features paintings, sculptures and decorative arts from around the world. It also has more than 25 exhibits each year. Next door to LACMA is the La Brea Tar Pits. This is a spectacular outdoor exhibit featuring fossils from the ice-age. For car enthusiasts, across the street from LACMA is the Petersen Automotive Museum. It contains incredible exhibits depicting the history of the automobile. You can practically travel back in time and see authentic cars starting in the late 1800's through to modern day cars built for royalty. Just up the street, off Fairfax, you can have a meal and get some shopping in at The Grove Shopping Center and the Farmer's Market. In the Farmer's Market you can buy fresh fruit, handmade treats, and snack outdoors on a variety of specialty foods in this famous open-air market. Then you can take a trolley car to get to the center of The Grove, a new luxury shopping center fashioned after a European Village. Shop at such stores as Nordstrom, Pottery Barn and The Gap for souvenirs your friends and family will really love. A trip to LA would not be complete without a stroll down Melrose Ave (as in Melrose Place, the series). There you will find a mix of upscale, hip and funky shops along with a variety of ethnic restaurants and neighborhood bars. Along the way you may even run into some of today's young starlets having coffee or trying on vintage t-shirts.